← Still talking about oars! It’s been a good team effort getting the new oars done.This is a short report on our experience. We decided to go with the longer oars, 4.3 metres at stations 1, 2 and 3 and 4 metres at station 4, i.e. 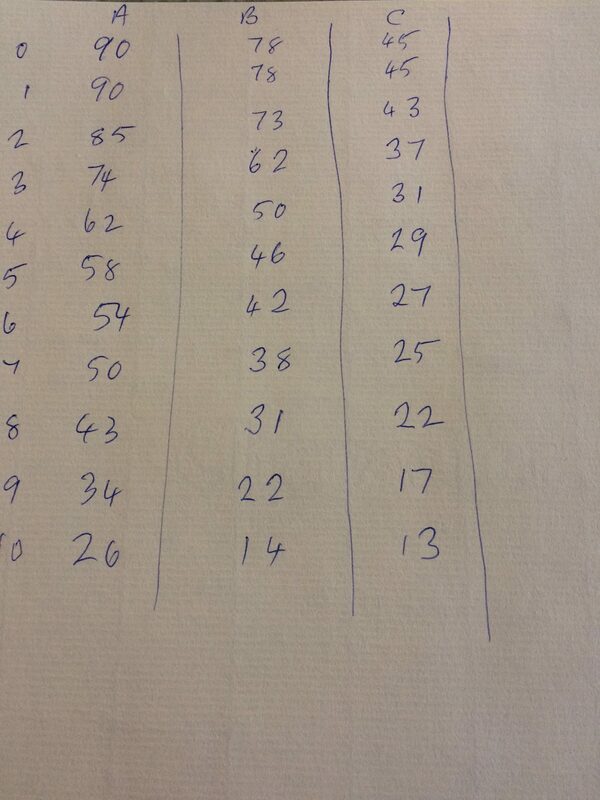 fourteen and thirteen feet, using the same basic construction ideas as our existing oars but making us a long oar club. We decided to stick with flat blades, as we think they’re easier for beginners and suspect that the membership will not support the introduction of spoon blades, whatever the potential gain in efficiency. 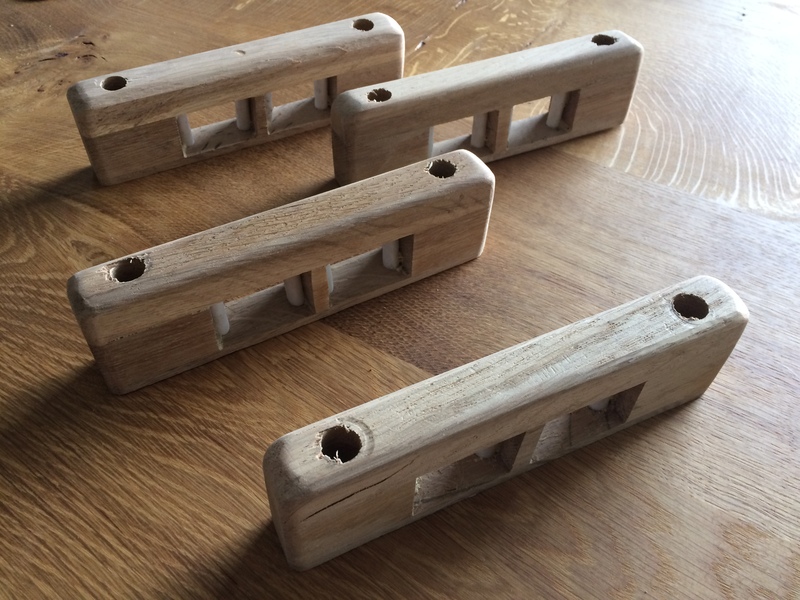 The handles are got out from solid Douglas fir, spliced to shafts that have centres of Western Red Cedar with protective strips of Douglas fir on the front and back faces. We think this is advisable given how easy it is to damage the cedar. Topher provided dimensions for oars that start at 90mm fore and aft by 45mm deep and taper toward the tip, which we then adjusted to allow for the Douglas fir strips, giving the following dimensions, ten stations from the pin to tip, column A being fore and aft, column B the same corrected and column C the depth. The shafts were quite tricky to get out, because of the need to be very accurate, especially as one got near the tip. I had to balance my fear of planing off too much with increasing worries that that the results wouldn’t be strong enough, compounded by the fact that the WRC centres looked very skimpy prior to the strips being added. The next step was applying the strips, which Mr H had kindly machined for us. 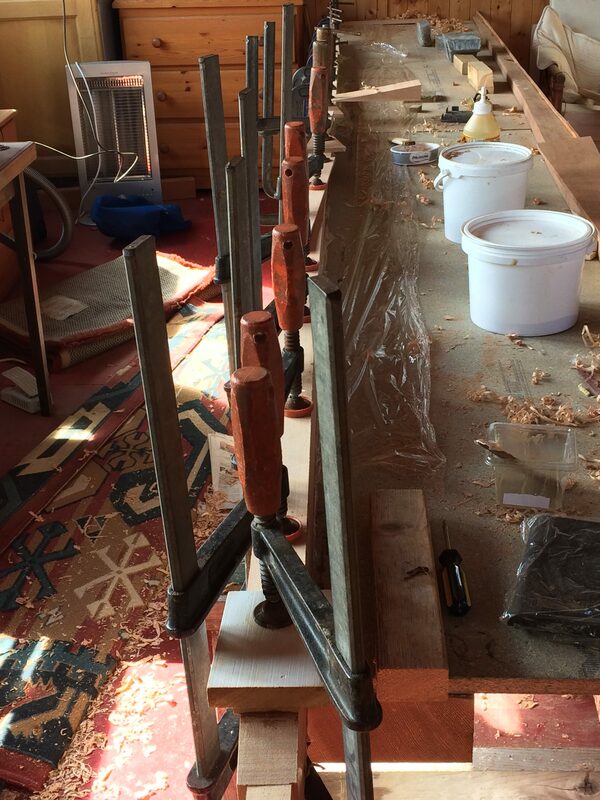 So many clamps were needed that this resulted in eight separate gluing sessions. Once the strips were on they were cleaned up and the edges rounded, then given a good sanding. Our flat blades are a slimmed down version of what we already have, with a reduced surface area of about 160 square inches against our previous 185 and the length drawn out to 36 inches. 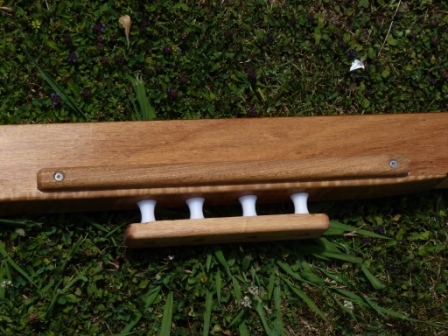 The handles were rounded off and the oars delivered to Ray the Happy Varnisher for his magic. In the meantime we considered how to go about the oar gates. The aim is to produce a more accurate hold and eliminate the clunking in the present system of a plywood plate. The design produced by Don Currie of New Zealand looked about right, but we decided to limit ourselves to two gears, ratio 3.0:1 and 2.8:1. The white rubbing strips inside are from scrap rigging that had been condemned for insurance purposes and is widely available free from boatyards, duly sawn up. Here is the prototype for comparison. 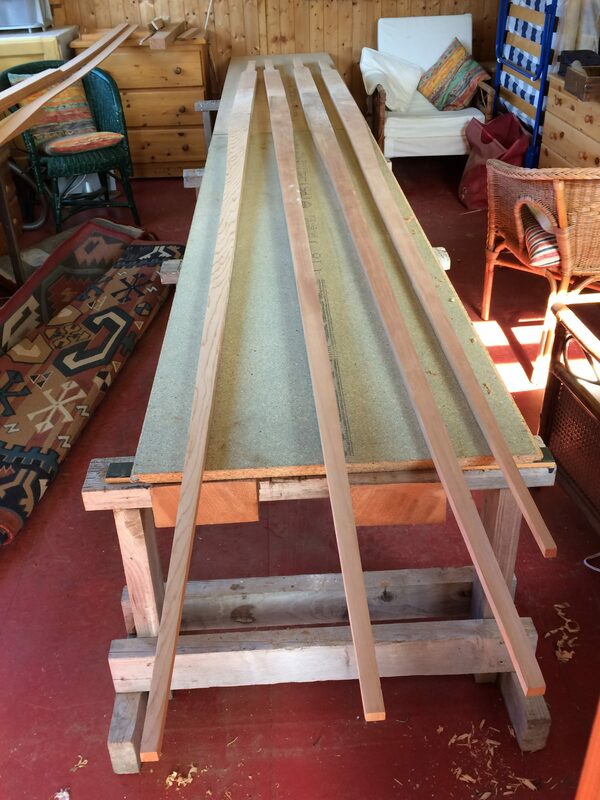 Overall I would say that no greater skills were required than for our original oars, just more time and care to ensure that the finer tolerances were kept to and to handle the finer strips. We will call the new oars the Cluthas, as we expect them to bring us to victory on the Clyde in a week’s time. 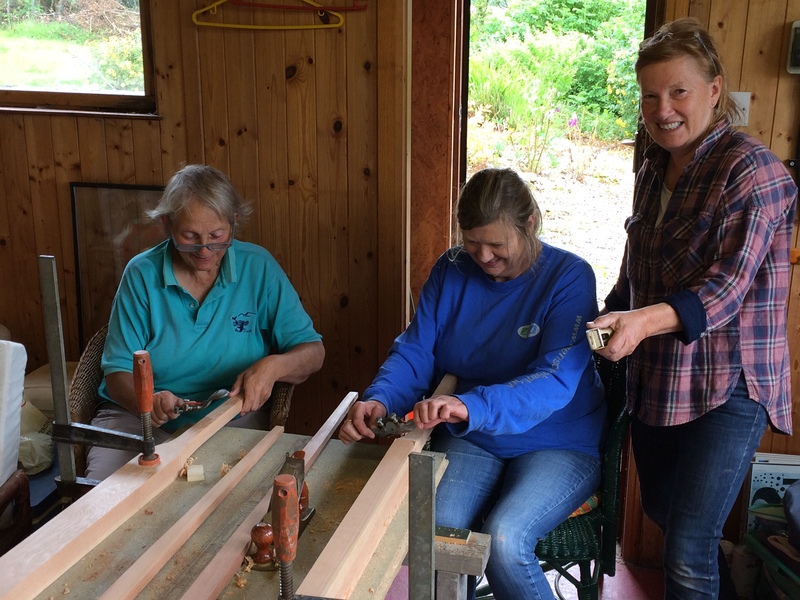 This entry was posted in Building the boat, Uncategorized and tagged making oars, Scottish Coastal Rowing Association. Bookmark the permalink. 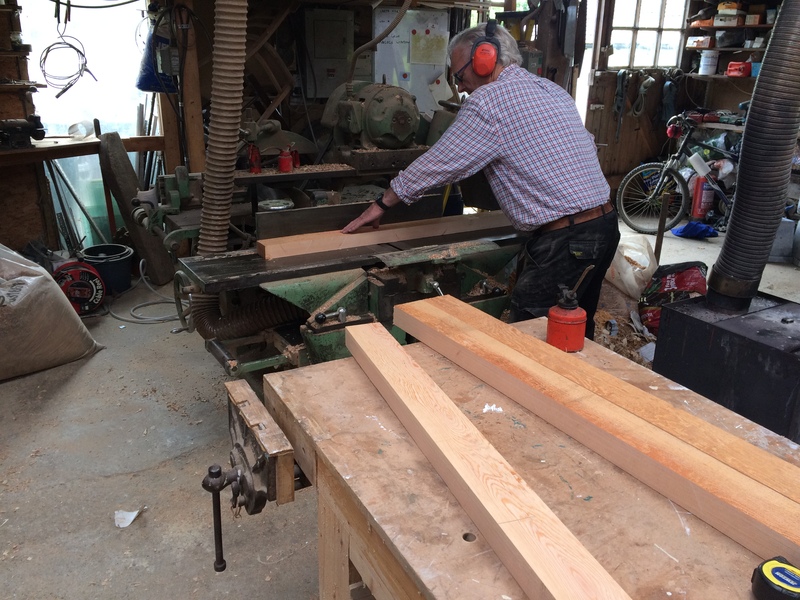 Thanks to Ewan for leading the team, which in truth played a very small role in the construction of the oars – many thanks for all your time, expertise and hard work!